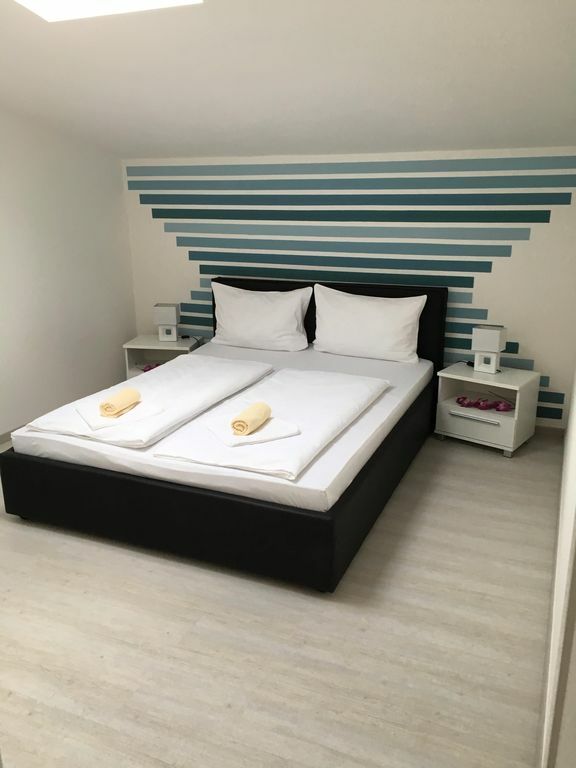 Our newly renovated fully air-conditioned attic apartment (3 star category) is located on the 3rd floor of a newly built, quiet and very well maintained apartment building, only 50 meters from the sea and 300 meters from the vibrant town center. It includes a very nice living room with a large comfortable corner sofa set which is also suitable for sleeping up to two people. The living room cabinet is equipped with TV, recorder and satellite receiver. The bedroom is furnished with a double bed, the 2. Bedroom with 2 single beds. The apartment has a small kitchen with stove and coffee maker, and a dining table for 4 people. On the beautiful large balcony you have to end the day with a glass of wine at sunset in the evening. A boat mooring can be rented separately from us. Location: The apartment is located in Medulin, the tourist center on the southern tip of Istria. The beautiful promenade with numerous excellent cafes and restaurants invites you to feast and enjoy. The mild Mediterranean climate, breathtaking scenery and safe wind conditions make this region one of the most popular destinations for sports and water sports enthusiasts. The unique one kilometer long, gently sloping sandy beach attracts families with small children. Not far from the beach, the amusement park offers numerous attractions for children and adults alike. z. B. Rodeo riding, bumper cars, carousels, slides, trampoline jumping and much more. Because of the excellent location of our apartment you do not need a car. The promenade, the beach, the numerous cafes, restaurants and grocery stores are only a few minutes walk away or you can take the small tourist train along the beaches. Special offers: Exclusively with us !!!!!! Multiple bookings are possible due to several apartments. Experience an unforgettable holiday with us. La settimana che abbiamo trascorso a Medulino e' stata una settimana fasntastica la casa dove alloggiavamo era perfetta per 4 persone. Sicuramente ristrutturata da poco con tutti i confort che servono, un bagno pulito come il resto della casa comprese tutte le posate e le padelle. Dotata di aria condizionata e visto il caldo che ha fatto e' servita durante il giorno. La spiaggia a 10 minuti a piedi ideale per i bambini dove i genitori non devono preoccuparsi visto che l'acqua e' molto bassa per una lunga percorrenza. E stata una vacanza da ricordare anche per il tour in barca sicuramente torneremo e speriamo di alloggiare ancora nello stesso posto. Sehr nette Vermieter, es wird alles gehalten wie versprochen . Waren sehr erstaunt von diesem Apartment. Ein tolles Apartment alles da was man braucht sehr nette Vermieter sprechen deutsch . Wir waren im September da. Herrlich ein Traumhafte ruhige Lage. Unsere Vermieter waren toll und haben sehr viele Tips gegeben. Das Appartment hat unseren Vorstellungen voll entsprochen wir haben uns sehr wohl gefühlt. Hallo, ich war mit meinem Mann und meinem 5 jährigen Sohn für 10 Tage in dem Beni Appartment untergbracht. Es hat uns dort sehr gut gefallen. Das Appartment ist sehr gemütlich eingerichtet und ausreichend ausgestattet mit Kaffemaschine, Wasserkocher usw. Die Anlage und das Appartment sind sehr gepflegt und schön gestaltet. Das Meer und der Strand sind nur wenige Gehminuten entfernt, also auch mit Kind einfach zu erreichen. Die Ortschaft ist nah gelegen und bietet viele Einkaufsmöglichkeiten und Unternehmungen. Wir wurden bei unserer Ankuft persönlich und wirklich freundlich begrüßt und zu unserem Appartment gebracht. Alles in Allem hatten wir eine Schöne Zeit in Medulin und würden jederzeit wieder kommen. Liebe Vermieter! Hiermit möchten wir uns nochmal für den wunderschönen Urlaub und die so schnelle Hilfeleistung bedanken. Wir (Mann, unser Sohn und ich) waren in diesem Appartment für traumhafte 2 Wochen untergebracht. Leider hatten wir breits nach 1 Woche einen kleinen Zwischenfall mit unserem Sohn. (Seeigel - sehr schmerzhaft :( ) Wir hatten dann unsere Vermieter angerufen für Hilfe. Diese waren gleich vor Ort und halfen uns auch als Dolmetscher im Krankenhaus. Medulin is located at the southern tip of Istria, where it is next to the 8 km from Pula a popular tourist center. The place has a magnificently structured, long coastline and is surrounded by a ring of small islands. You can reach Medulin from Munich in about 6 - 7 hours. Medulin is recommended for all ages, and for a variety of interests. The unique one kilometer-long sandy beach of Medulin, Bijeca, attracts families with young children. In addition to the four hotels and two major campgrounds numerous private landlord attract sun seekers. Although in the summer months, many people spend their holidays here, it is still possible to find something away from the center of rest and relaxation. Near the sandy beach, a new center was built, which is also known as a promenade of Medulin. On this boulevard there are a large number of good restaurants, bars, shops, souvenir shops and much more. Against the evening promenade is always busy and there you can stroll, romantic dinner or go visit the nearby Luna Park. Who would like to have it easy, the loads of the small village square in the old center of Medulin not only in the evening to take a leisurely stroll. You will find excellent restaurants in the area that offer besides typical Croatian dishes and international cuisine. Information: The location of the apartment, there may be slight variations occur due to inaccuracies in the presentation by Google in Croatia. Einmalige Anmeldung als Turist pro Person 5€ , Sie freuen sich bereits auf Ihren gebuchten Urlaub? Urlaub ist bereits gebucht? Vergessen Sie jedoch nicht, es kann immer das Unvorhergesehene passieren! Denken Sie weiter mit TravelSecure®. Leider kann bereits ein unerwarteter Anlass, wie ein Beinbruch vor Urlaubsantritt, Hunde 6€ am Tag Preis bis 4 Personen, jede weitere Person 10€ pro Ta https://www.travelsecure.de/tarifrechner/default.aspx?partnerid=1-8-3763 Sie freuen sich bereits auf Ihren gebuchten Urlaub? Urlaub ist bereits gebucht? Vergessen Sie jedoch nicht, es kann immer das Unvorhergesehene passieren! Denken Sie weiter mit TravelSecure®. Leider kann bereits ein unerwarteter Anlass, wie ein Beinbruch vor Urlaubsantritt, Rrücktrittskosten : Ab der Buchung 50% bis zum 28 Tag vor Anreise werden 50% Stornogebühr erhoben Ab dem 28 tag bis zum 14 Tag vor Anreise werden 80-% Stornogebühr erhoben Ab dem 14 Tag vor Anreise werden 100-% Stornogebühr erhoben .